From Phys.org: With the rising shortage of skilled workforce in agriculture, there's a growing need for robotisation to perform labour-intensive and repetitive tasks in greenhouses. Enter SWEEPER, the EU-funded project developing a sweet pepper-harvesting robot that can help farmers reduce their costs. The team of experts involved in the project recently gave a live demonstration of the technology in a commercial greenhouse in the Netherlands. A video on the project website shows the robot in action. The video explains that the SWEEPER robot consists of an autonomous mobile platform with a robotic arm holding an end effector for fruit harvesting. 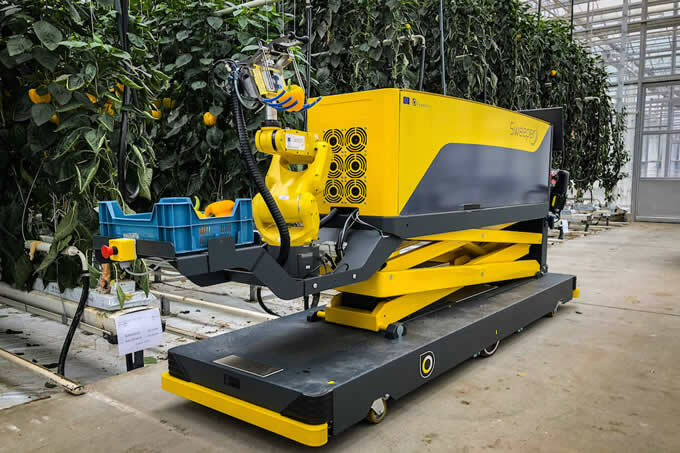 As stated in a press release on the project website, the robot is "designed to operate in a single stem row cropping system, with a crop having non-clustered fruits and little leaf occlusion." According to the same press release, preliminary test results showed that by using commercially available crop modified to mimic the required conditions, the robot harvests ripe bell peppers in 24 seconds with a success rate of 62 %. In laboratory experiments it was possible to harvest 1 fruit in less than 15 seconds, excluding platform movement.